Gayatri here today. 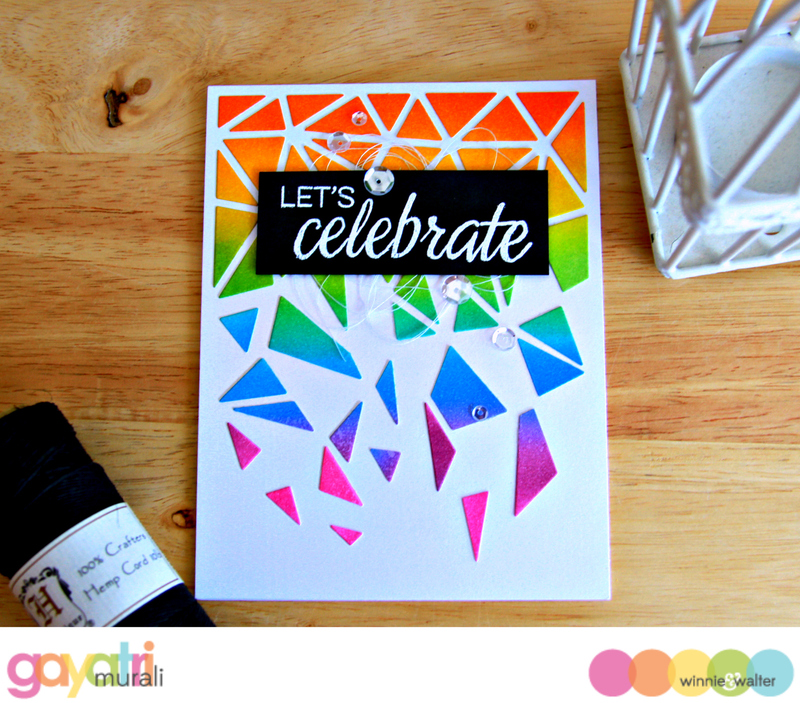 I am sharing a bright and bold card made using the negatives from Cover Model: Multifaceted Cutaway. My concept of a bright and bold is to use lots of vibrant colours with plenty of contrast. Plus I wanted to use a technique or two on my card. So I started with sponging and blending distress inks to make a rainbow coloured panel. I sprayed clear shimmer all over the panel. Once dry, I adhered the panel to double sided adhesive sheet and then die cut the panel using the Cover Model: Multifaceted Cutaway. Now I have the die cut and its negatives stickers. On my card base, I used the positive multifaceted die cut as my guide to stick my negatives back inside. I stuck the negative pieces all in place up to a quarter of the way, then randomly, spacing out the end. I then removed the positive die cut which I used as the guide. I am left with the negative pieces in rainbow colours as though the pieces are falling like confetti. Love the bright colours and contrast against the white background. To add more contrast, I white heat embossed the sentiment from The Party stamp set on a piece of black cardstock. I then adhered this sentiment strip on the card front using foam adhesives with some bunched up thread under it. Finally embellishing with Pretty Pink Posh Sparkly Clear sequins. Hope you liked my version of bright and bold card. 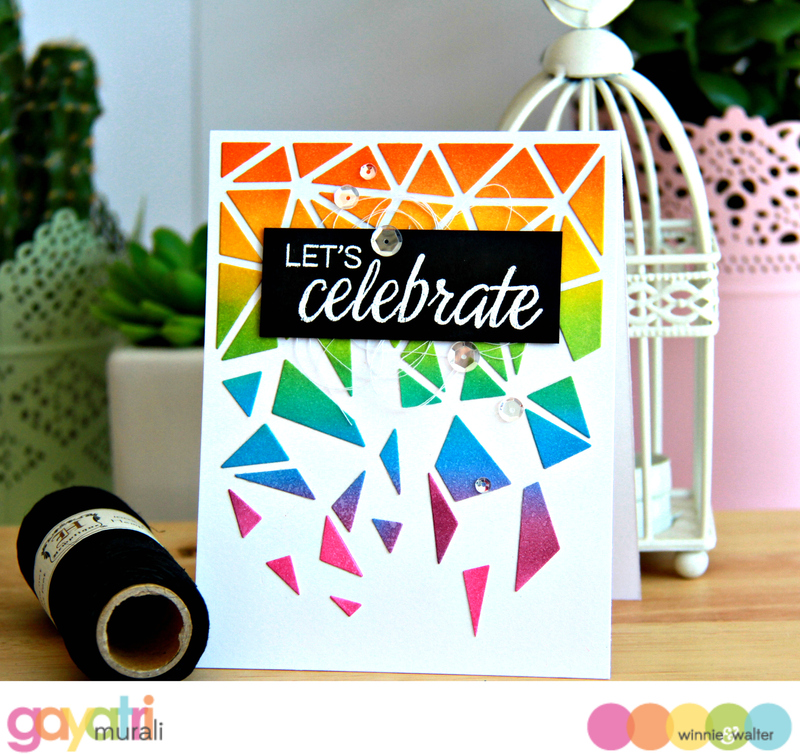 PS - CONGRATULATIONS on making the FRONT PAGE of Australian Cardmaking, Stamping & Papercraft this month - ALL 3 of your features were FABULOUS!!! I am so in love with card..its vibrant ..trendy !! Beautiful!! It reminds me of pieces of broken glass falling from a window above, very cool effect! You just amaze me with your creative ideas, Gayatri! This beautiful card is a wonderful result! Wow!! this is so cool!! I love the fabulous colors you used!! This is a stunner! I love everthing about it! Love it Gay-what a great effect! Love how you can use the cutaway die like this...stunning. 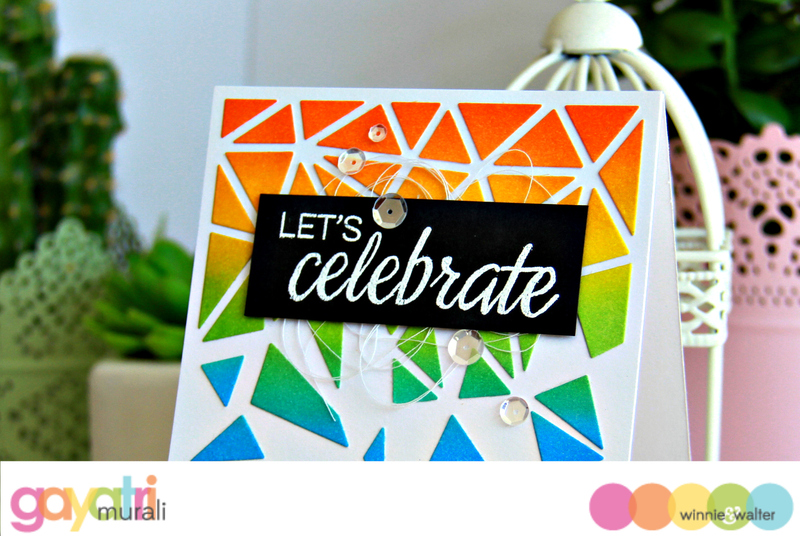 Love this look with the negative sponged die cuts! It reminds me of stained glass!